St Edwards Park is one of those parks that your kids will love visiting. 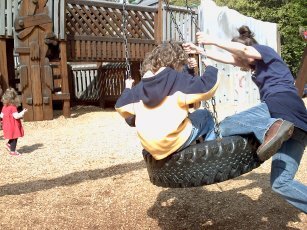 No matter how many attractions we go to or cool things we see while we're in Seattle, it seems that our kids' favorite thing to do is go to the park and play on the playground. 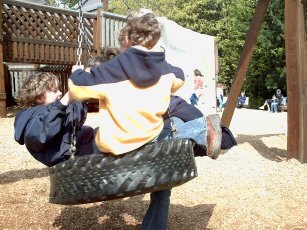 Well, one of the best playgrounds we've seen in Seattle is the one located at St. Edwards State Park located at the north end of Lake Washington in a town called Kenmore (6700 NE 181st St). The park was originally used by the Native Americans as a prosperous fishing location. However, the state of Washington purchased the park from the Catholic Diocese of Seattle in 1977 because of declining interest and enrollment in the seminary. In all, there were 316 acres sold, which included the actual seminary. Since then, it's been turned in to a favorite spot used by many people, whether for picnicking, playing with the kids, relaxing in the shade, or even mountain biking on one of the many trails that head down to the water. Speaking of the playground, the one here at St. Edwards Park has got to be one of the coolest ones we've been to in Seattle. On the weekends when the park gets busy, there can be a ton of kids and it can get a little hectic trying to keep track of your own kids, but it's still fun. The park is open from eight in the morning until dusk, so you've got plenty of time to check it out. Back from St Edwards Park.